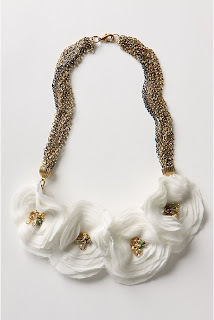 Bead Up -- the journey of handmade jewelry: Fashionably Friday: Statement Necklaces on "Sale"
A garland with a Goth aesthetic, this necklace is made of grosgrain ribbon accented with chiffon flowers. Flowers have raw edges and black gem centers. 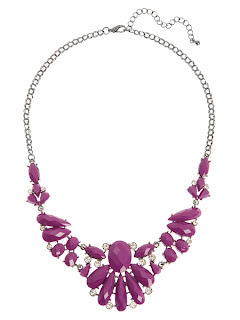 "OOOooooooooooooh," I literally said when I saw this necklace. Me likie. I can see this as a great accent piece to any simple white t-shirt or even formal dress. And the best part? It's only $16! I have seen similar necklaces for sale at Forever XXI, yet had never heard of this "Torrid" shop. I sent the link to a friend and told her to check it out (since she likes affordable trendy jewelry, too). She later snapped in shock: "Woman! It's a plus size shop!" Woops! Totally didn't mean anything suggestive by it, Nicole! The second necklace that the Stylelist originally listed wasn't available on Anthropologie's website for some reason, so this was the next best thing. And best indeed. I like it - ALOT. I wish I had thought of it - the combination of colors, the chain, and the delicate and beautiful flowers. And for $42, I think it would be an excellent Christmas wish-list item. Stamped Circles Necklace Gold look stamped circles layered neckwear measuring 66cm in length. 100% Metal. $25 from "TopShop"
Arugh, me hearties. Bin turned me facebook settin's on to scurvy pirate mode this day hearty thanks to 'tis treasure chest 'o a necklace. Never run out 'o doubloons fer th' parkin' meter again! (translation courtesy of this website - hilarious)! Makes me want to eat the 80's-tastic Honeycomb cereal. Looks like a bulls eye for stingers! This isn't a total fail... totally... I feel that it's trying to be statement-y yet is lacking a "ka-pow!" element to it. In fact, it looks a little cheap and tacky, if you ask me. And for $58, well, you probably already know where I stand...! Antique Gold Manor Necklace A wonderfully lush necklace, dripping with dozens of various-size resin beads hand painted in metallic hues to evoke an antique glass effect. 12K shiny, textured gold-plated double oval ring brass chain. Signature spring clasp closure. I really, really, really don't like the first necklace. It looks like seaweed or some kind of growth from the underworld. However, when I noticed that they also offer it in a bronze color, my heart softened a bit. Then it went back to cold thanks to the $128 pricetag. Ugh. So I went back to the 80's and brought back this poop brown piece of rope from when rope bracelets were cool. Then I added some poop brown beads in between, ya know, to give it an urban flair. Then I used the most plain and boring imitation silver clasp I could find to, ya know, give it some chic. And of course it's exclusive to Urban Outfitters because, well, no one else wanted it. But no worries! We've put you, the customer, in mind and lowered the price to $19! That's $15 in savings - you can buy one for you AND your friend! And all you have to do is "wipe clean!" Makes a great dog leash or boating accessory, too! Ok, now that I've gotten that outta me, I am off to enjoy the weekend. Hope you have a fabulous one, too! That Cabochon one reminds me STRONGLY of Jewel Secrets Barbie, for some reason. It totally looks like costume jewelry, I guess. Kate - hilarious! Totally, totally on target! Did you get my email reagrding adoption? What surprises me is how much of this stuff is made with plastic! Eeeeeeek! And at those prices, mass produced in China, probably? No, thanks, I'll just make something. I have cotton voile so I think I am going to make the Rannuculus necklace. It will cost me a heck of a lot less!